The American Farm Bureau’s Agricultural Safety Awareness Program (ASAP), UMASH and the US Agricultural Centers funded by the National Institute for Occupational Safety and Health (NIOSH) are spotlighting agricultural health and safety with a variety of resources for farmers and ranchers, farmworkers, farm families, and others to promote Ag Safety Awareness Program (ASAP) Week. 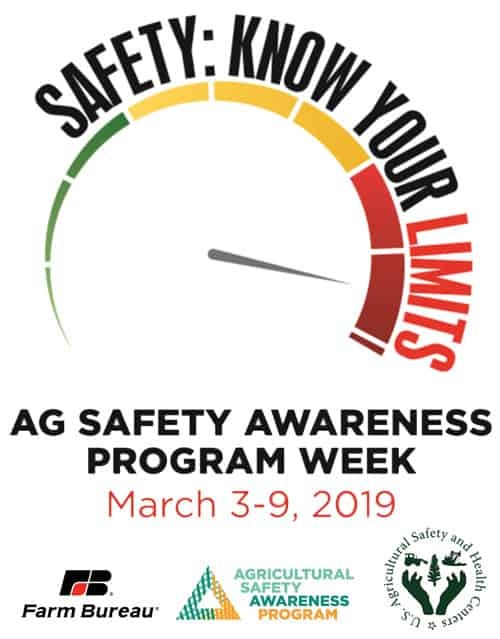 The 2019 Agricultural Safety Awareness Program (ASAP) Week will be celebrated March 3-9. The theme for the week will be “SAFETY: Know Your Limits” and will highlight a different safety focus each day of the week. Follow us on social media for resources on these and other agricultural health and safety topics, as well as information about webinars during ASAP week. Subscribe to the UMASH email for agricultural safety news, events and safety resources. YOU CAN HELP SPREAD THE WORD ABOUT AG HEALTH AND SAFETY! It’s easy! Using the provided ASAP Social Media Toolkit and other prepared resources, you can participate in ASAP Week! In addition to the prepared resources, we encourage you to develop your own promotional ideas! Promote ag safety at your workplace and in your community, reach out to local farm businesses, protect your workers with safety training, host an event, share in media and news. Make ag safety part of your conversation throughout the week! JOIN THE FUN AND PROMOTE ASAP WEEK. YOU MIGHT WIN A FLASHLIGHT! 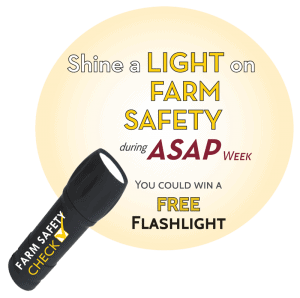 When you share with us how you promoted farm safety during ASAP week, you will be entered into a drawing for a free LED flashlight. Up to 10 submissions will be randomly selected to receive a flashlight. POST a farm safety tip or fact on social media. PROMOTE farm safety at events or workplace. SHARE about ASAP week in a newsletter. REACH out to farm businesses or co-ops. PROTECT your workers with training, equipment, or other safety measures. FREE ag health and safety resources including videos, fact sheets, and posters on a variety of topics. Download agricultural safety and health resources created by UMASH, our pilot project programs, and collaborating institutions. Una variedad de materiales de seguridad y salud en agricultura creados por UMASH y organizaciones con las cuales colaboramos. UMASH Ag Safety and Health: Stories from the Field highlights the stories of farmers and farm families – their experiences with injury or disease on the farm, as well as what they learned and suggestions for prevention.